Our eXtreme Dog Fence® brand, solid core dog fence wire is the best quality dog fence underground boundary wire available, and it's made in the United States. This wire is designed to perform and keep your dogs and puppies safe. 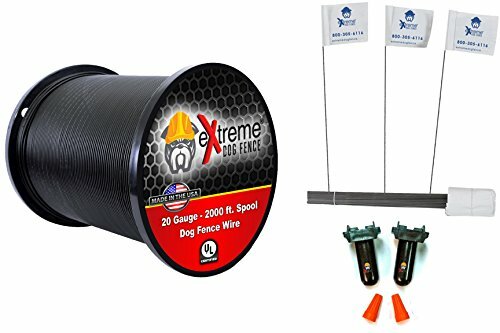 Rest assured, knowing you are getting the real eXtreme Dog Fence® brand wire. This is a continuous 500' spool, not multiple smaller spools, so you will not have to do excess splicing to meet your needs. The Included eXtreme Dog Fence® waterproof splice kits ensure that your wire will not oxidize or degrade, being exposed to the elements. The training flags should be placed at every 10 foot interval along your boundary wire, during your pet's training period. For professional wire splice kits and other pet supplies, visit our Amazon store at: www.amazon.com/shops/electricdogfence. We appreciate you. American Made: Extreme Dog Fence® Brand Dog Boundary Fence Wire is Proudly Manufactured in the USA. View More In Radio & Wireless Fences. If you have any questions about this product by Extreme Dog Fence, contact us by completing and submitting the form below. If you are looking for a specif part number, please include it with your message.